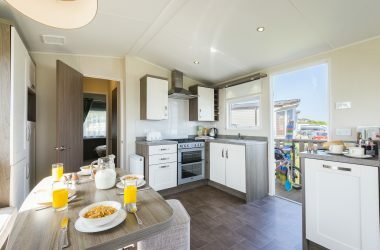 The perfect sociable caravan, the Cameo has a relaxed open plan layout with plenty of comfy seating and a banquette dining area. Ideal for entertaining! Our widest model of the caravans we have, the Cameo very is spacious, and the picture window and French doors let in lots of that beautiful, clear St Ives light. Some of the Cameos have sea views – please check when booking. 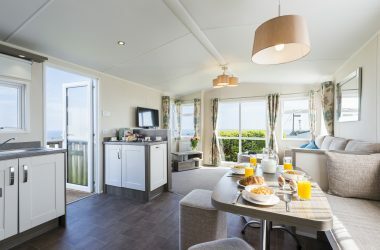 You will find that one of the stand-out features of this caravan is the light and roomy master bedroom which really benefits from that extra foot of width. 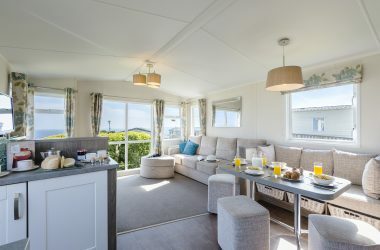 A high-spec and modern caravan, which is great for year-round family holidays. The campsite is in a fantastic location. Leave your vehicle at the holiday park and take a leisurely stroll down into lovely St Ives. The stunning South West Coast Path runs through the campsite, so you’re just moments away from spectacular clifftop scenery. The Garrack Hotel is next door to Ayr Holiday Park. We own and manage this small but welcoming hotel, so you can make the most of the indoor swimming pool and sauna (for a small charge), and also enjoy a meal in the restaurant or café bar, lovely food and a beautiful view.